Our Butler family is from England. A great many other Butler families are claimed to be from Ireland. Either way, the Butler name itself is derived from the French word butuiller (a servant in charge of a wine cellar). Steven Butler was born circa 1575 in England. He apparently died in England. There is hardly anything known of the life of Steven Butler. In fact, there is no real evidence that Steven was the father of the below four children. Some have suggested that his Steven's father's name was John, but there is no source to confirm this. It has also been suggested that his wife's name was Mary, but again, there is no known confirmation of this. He had four identified children, two sons who went to New England and two daughters who remained in England. Steven apparently lived in Braintree parish in Essex, England. Others have suggested that Steven and his wife moved to Wethersfield, Connecticut, with their sons, but this is unlikely. Steven married unknown (possibly Mary) in about 1600 in England. 1 William Butler was born circa 1604 in England. He died after May 11, 1648 in Hartford, Hartford Co., Connecticut. He married Eunice Coffin. She died before 1648. William wrote his will in 1648, in which he described no surviving wife or children. Instead, he mentions his brother Richard Butler of Hartford, Connecticut and the children of his sisters Mrs. West and Mrs. Winter, living in England. 3 Unknown Female Butler was born in England. She apparently had children, but any details are unknown. Some online sources have suggested that her given name was Jane, but the sources for this claim are unknown. She was named in her brother William's will of 1648 as "Sister Weste" whose children were living in "old Ingland." 4 Unknown Female Butler was born in England. Richard Butler was born circa 1608 in England. He died on August 6, 1684 in Hartford, Hartford Co., Connecticut 1,2. Richard apparently moved to New England with his brother William in about 1632 or 1633. Richard wrote his will in 1677, in which he mentions his wife Elizabeth and his children: Thomas, Samuel, Nathaniel, Joseph, Daniel, Mary, Elizabeth and Hannah. Richard may have been married first to a woman whose name is not known. Their marriage may have been during the late 1620's or early 1630's, most likely while they were both still living in England. Researchers have claimed over the years that several of Richard's children (Mary, Thomas, Hannah or even Nathaniel) were children by his first marriage. I have no reason to believe this, nor is there any proof that he was married to anyone before Elizabeth. I have placed all of Richard's children with his wife Elizabeth (see reasoning below). Apparently the basis of this claim about his first marriage is that he "came to Hartford mourning the death of a wife and infant" 1. My interpretation of this is that if in fact he was previously married, that his wife and any child (or children) that they had together both died while living in England. There is no proof of Elizabeth's parentage, but it is likely that she was a close relative of John Bigelow/Biglo of Watertown, Massachusetts. The inference that she was his sister (and thus daughter of Randall and Jane) is simply the best educated guess. Elizabeth's estate was probated on December 3, 1691, in which she specifically named her children as Nathaniel, Joseph, Daniel, Samuel and Elizabeth. Another portion of the estate also mentions her child Abigail Butler (???). Many researchers have interpreted this record to mean that since Elizabeth only mentions that the above five children were her own, that Richard Butler's other known children (Mary, Hannah, and Thomas) must have been his children by an earlier marriage. This is ridiculous reasoning. The simple reality that was overlooked is that Mary, Hannah and Thomas all died before 1691, when Elizabeth's probate was recorded. No wonder she didn't name her children that were already dead. Additionally, Richard Butler's will of 1677 clearly specifies that his wife Elizabeth was the mother of his daughter Mary (of course, this doesn't prove she wasn't her stepmother, but it is too much to be overlooked). 1 Mary Butler was born circa 1635. She died on September 12, 1689 in Wethersfield, Hartford Co., Connecticut. 2 Thomas Butler was born circa 1637. He died on August 9, 1688 in West Hartford, Hartford Co., Connecticut. 3 Samuel Butler was born circa 1639. He died on December 31, 1692 in Wethersfield, Hartford Co., Connecticut. 5 Elizabeth Butler was born circa 1643 in Wethersfield, Hartford Co., Connecticut. She died on April 28, 1729. 6 Joseph Butler was born circa 1648. He died on December 10, 1732. 7 Daniel Butler was born circa 1650. He died on March 28, 1692 in Hartford, Hartford Co., Connecticut. 8 Hannah Butler was born circa 1652. She died before 1685. Nathaniel Butler was born circa 1641 in Hartford, Hartford Co., Connecticut. He married Sarah (maiden name possibly Green, or Banbury) in about 1665. 1 Samuel Butler was born circa 1665 in Wethersfield, Hartford Co., Connecticut. 2 Sarah Butler was born on September 23, 1667 in Wethersfield, Hartford Co., Connecticut. 4 Hannah Butler was born on November 14, 1672 in Wethersfield, Hartford Co., Connecticut. 5 Abigail Butler was born circa 1674 in Wethersfield, Hartford Co., Connecticut. 6 Ruth Butler was born circa 1676 in Wethersfield, Hartford Co., Connecticut. William Butler was born circa 1670 in Wethersfield, Hartford Co., Connecticut. He married Hannah Hills on May 23, 1695 in Wethersfield, Hartford Co., Connecticut. She was born circa 1672 in Hartford, Hartford Co., Connecticut and died on April 17, 1743 in Wethersfield, Hartford Co., Connecticut. She is buried in the Wethersfield Cemetery, Wethersfield, Hartford Co., Connecticut. 1 Eunice Butler was born on January 12, 1695/6 in Wethersfield, Hartford Co., Connecticut. 2 Sarah Butler was born on January 11, 1697/8 in Wethersfield, Hartford Co., Connecticut. She married Ebenezer Wright on March 1, 1721/2 in Wethersfield, Hartford Co., Connecticut. 3 Peter Butler was born on April 9, 1700 in Wethersfield, Hartford Co., Connecticut. He died on September 24, 1732 in Middletown, Middlesex Co., Connecticut. He is buried in the Old Riverside Cemetery, Middletown, Middlesex Co., Connecticut. 5 Ruth Butler was born on April 29, 1702 in Wethersfield, Hartford Co., Connecticut. John Butler was baptized on April 13, 1707 in Middletown, Middlesex Co., Connecticut. He died before March 1, 1748 in Middletown, Middlesex Co., Connecticut. He married Sarah Foster on December 3, 1728 in Middletown, Middlesex Co., Connecticut. She was born on October 1, 1710 in Middletown, Middlesex Co., Connecticut. She died before June 27, 1754 in Middletown, Middlesex Co., Connecticut. 1 Hannah Butler was born on December 20, 1729 in Middletown, Middlesex Co., Connecticut. 2 William Butler was born on September 29, 1731 in Middletown, Middlesex Co., Connecticut. 3 Peter Butler was born on August 10, 1733 in Middletown, Middlesex Co., Connecticut. 4 Sarah Butler was born on June 20, 1736 in Middletown, Middlesex Co., Connecticut. 5 Ruth Butler was born circa 1738 in Middletown, Middlesex Co., Connecticut. 6 John Butler was born on January 16, 1741 in Middletown, Middlesex Co., Connecticut. 7 Comfort Butler was born on November 6, 1743 in Middletown, Middlesex Co., Connecticut. He died on February 19, 1826 in Meriden, New Haven Co., Connecticut. He is buried in the Broad Street Cemetery, Meriden, New Haven Co., Connecticut. 9 Mehitabel Butler was born on September 30, 1747 in Middletown, Middlesex Co., Connecticut. Thomas Butler was born circa 1745-1746 16 in Middletown, Middlesex Co., Connecticut. He died on August 5, 1815 16 in Hinseburg(h), Chittenden Co., Vermont. He is buried in the Gilman Road Cemetery, Hinesburg, Chittenden Co., Vermont. Thomas was most likely born in Middletown, Connecticut, but his birth record is not recorded in the town. His father died in 1747 or 1748, when Thomas was only 2 or 3 years of age. Then, Thomas' mother died before 1754, when he was no older than 9 years of age. As a young orphan, Thomas' whereabouts over the next 10 or 15 years are questionable. It seems that Thomas and his siblings were dispersed into the guardianship of different relatives. It is likely that Thomas went to live in Wallingford (in the part that is now Meriden), Connecticut to live with some older siblings. Eventually, as a young adult he went to Salisbury, Connecticut. There, he married Jane White in 1769. Thomas and Jane began raising a family in Salisbury, Connecticut. In about 1776-1778, they moved away from Salisbury. It appears that they moved to Adams, Massachusetts, where they probably only lived for a handful of years. In 1785, they moved with their family to Hinesburg(h), Vermont 23. Thomas and his wife remained in Hinesburg for the duration of their lives. Thomas wrote his will on October 6, 1814, in which he named his wife and his 8 surviving children. Thomas married Jane White on June 1, 1769 in Salisbury, Litchfield Co., Connecticut 12,13. She was born on August 27, 1752 in Salisbury, Litchfield Co., Connecticut 17. She died on March 4, 1834 16 in Hinesburg(h), Chittenden Co., Vermont. She is buried in the Gilman Road Cemetery, Hinesburg, Chittenden Co., Vermont. 1 Polly Butler was born on November 20, 1770 in Salisbury, Litchfield Co., Connecticut 12,13. She died after 1814. Polly was probably married before the enumeration of the 1790 census. She was listed in her father's will of 1814 as Polly Brown. One possibility of her husband's identity was a Barzilla Brown who was living in Fairfield, Vermont in 1790 and 1800, next to Polly's sister Hannah. Nothing furhter is known at this time. 3 John Butler was born on August 28, 1774 in Salisbury, Litchfield Co., Connecticut. He died sometime between 1790 and 1814. John was probably unmarried. The International Genealogical Index and some questionable sources provide the above birthdate in Salisbury, yet the town apparently does not record his birth. John was apparently living in his father's household in 1790. He was not mentioned in his father's will of 1814, and it is assumed he was dead by that time. 4 Sarah Butler was born on May 15, 1776 in Salisbury, Litchfield Co., Connecticut 12,13. She died on April 15, 1859 in Constable, Franklin Co., New York 6. She is buried in the Arnold Cemetery, Malone, Franklin Co., New York. Sally and her family lived in Hinesburg, Vermont until sometime during the 1830's, when they moved to Constable, New York. 5 Ruloff Butler was born circa 1778 in Massachusetts 18. He died on July 1, 1858 11 in Bellevue, Eaton Co., Michigan. He is buried in the Spaulding Cemetery, Bellevue, Eaton Co., Michigan. 6 White Butler was born circa 1781 19, probably in Massachusetts. He died on April 11, 1840 19 in Canton, Saint Lawrence Co., New York. He is buried in the Olin Cemetery, Canton, Saint Lawrence Co., New York. He married Elizabeth. (She was born circa 1789 19 and died on December 31, 1836 19 in Canton, Saint Lawrence Co., New York. She is buried in the Olin Cemetery, Canton, Saint Lawrence Co., New York. Sometime between 1810 and 1820, White moved to Canton, New York, where he remained. According to census enumerations, he and his wife probably had 6 or 7 children, yet the identities of none of these children are known. 7 Jane Butler was born on February 9, 1783 in Adams, Berkshire Co., Massachusetts 7. She died on March 20, 1823 in Middletown, Susquehanna Co., Pennsylvania 7. She is buried in the Middletown Center Cemetery, Middletown, Susquehanna Co., Pennsylvania. 8 Lydia Butler was born on September 3, 1786 in Hinesburg(h), Chittenden Co., Vermont. She died on July 3, 1868 20 in Starksboro, Addison Co., Vermont. She is buried in the Starksboro Village Cemetery, Starksboro, Addison Co., Vermont. 9 Catherine Butler was born on January 7 or 17 4,5, 1789 in Hinesburg(h), Chittenden Co., Vermont. She died on May 9, 1871 in Waco, McLennan Co., Texas 4,5. She is buried in the Oakwood Cemetery, Waco, McLennan Co., Texas. 10 Benjamin Butler was born on April 21, 1791 in Hinesburg(h), Chittenden Co., Vermont. He died on November 17, 1796 in Hinesburg(h), Chittenden Co., Vermont. 11 Almira Butler was born on September 14, 1794 in Hinesburg(h), Chittenden Co., Vermont. She died on November 29, 1796 in Hinesburg(h), Chittenden Co., Vermont. Hannah Butler was born on August 18, 1772 in Salisbury, Litchfield Co., Connecticut 12,13. She died on May 23, 1866 10 in Centerburg, Knox Co., Ohio. She is buried in the Robbins-Thurston Cemetery, Hilliar Twp., Knox Co., Ohio. Hannah spent her earliest years in Salisbury, Connecticut. In about 1776-1778, Hannah and her family apparently moved to Massachusetts where they probably lived in the remote town of Adams in Berkshire County. In 1785, the family moved permanently to Hinesburg(h), Vermont 23. It was there, in about 1786-1787 (when she was only 14 or 15) that Hannah was married to a young man named Zalmon Wheeler. 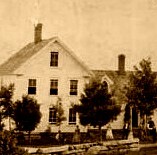 Soon after the marriage (or sometime between 1786 and 1790), the couple moved to Fairfield, Franklin County, Vermont, where their chidlren were born. Zalmon Wheeler died in 1799, leaving Hannah a 27-year old widow with six minor children. She remarried in 1802 or 1803 to a widower named Peter Thurston from the nearby town of Fletcher, Vermont. Hannah moved to Fletcher with her children at that time. Hannah and her family lived in Fletcher until 1813, when they moved out west to Granville, Ohio. Hannah and her family lived in Granville, Ohio for many years until her husband's death in 1827. In 1830, Hannah was living in McKean Township, in Licking County, Ohio just outside of Granville. In 1840, she was apparently enumerated in the household of her daughter Maria Chipman. In 1860, Hannah was head of her own household in Burlington Township, Licking County, Ohio. Sometime after this, she went to go live with her son Johnson Thurston in neighboring Knox County, Ohio, where she died in 1866 at the age of 93. Mrs. Thurston was a woman of great energy, endurance, bright intellect, and social culture, having remarkably uniform good health, a sound and strong physical body, which, together with similar qualities in her husband, produced a wonderfully healthy, vigorous and hardy family of children. She would weave fourteen yards of cloth a day after she was sixty years of age. She joined the Methodist church in Ohio. She married first Zalmon Wheeler in about 1787 in Hinesburg(h), Chittenden Co., Vermont. He was born circa 1762 in Connecticut and died on December 29, 1799 3 in Fairfield, Franklin Co., Vermont. He is buried in the Bradley Cemetery, Fairfield, Franklin Co., Vermont. 1 Mary (Polly) Wheeler was born on April 23, 1788 3, in Vermont. She died on May 20, 1863 3, probably in Wayne Co., Iowa. She is buried in the New York Cemetery, Millerton, Wayne Co., Iowa. 2 Almon Wheeler was born on October 1, 1789 in Fairfield, Franklin Co., Vermont 3. He died on January 5, 1827 14 in Malone, Franklin Co., New York. He is buried in the Morningside Cemetery, Malone, Franklin Co., New York. 3 Alfred Wheeler was born on August 4, 1791 in Fairfield, Franklin Co., Vermont 3. He died on November 11, 1850 in Fairfax, Franklin Co., Vermont 3,15. He is buried in the Carroll Hill Cemetery, Fairfax, Franklin Co., Vermont. 4 Salmon Wheeler was born on July 6, 1792 3 in Fairfield, Franklin Co., Vermont. He died on April 1, 1874 3, probably in Red Wing, Goodhue Co., Minnesota. He is buried in the Linwood Cemetery, Dubuque, Dubuque Co., Iowa. Salmon apparently moved with his mother and stepfather to Ohio in 1813, while his Wheeler brothers stayed behind in Vermont or moved to New York. Salmon settled in Burlington, Licking Co., Ohio, where he lived with his family for many years. Sometime between 1850 and 1857, he and his wife moved to Red Wing, Minnesota, where they remained. Although he and his wife were apparently buried in Dubuque, Iowa (where their daughter Matilda lived), there is no evidence that they actually died there. 5 Thomas Wheeler was born on February 9, 1796 3 in Fairfield, Franklin Co., Vermont. He died on December 6, 1861 8 in Indiana. He is buried in the Oak Ridge Cemetery, Bristol, Elkhart Co., Indiana. There is no definitive proof that Thomas was married to all six women listed above, but it is likely. The only wives we know with certainty are Cyrinthia and Hephzibah and the only children we know with certainty are Euphronius, Alfred, Almon, Marian, Thomas and Augustus. Sometime in this youth (during the 1810s), Thomas moved to western New York, probably with his uncle Joseph Wheeler (brother of Zalmon). He was apparently the same Thomas Wheeler who owned land in Ridgeway, Orleans County, New York between 1820 and 1829. He then moved to the neighboring town of Hartland, Niagara County, New York. Sometime between 1836 and 1838 he moved out west and settled with his family near the city of Bristol in Elkhart Co., Indiana, just a few miles south of the border with Michigan. In 1860, Thomas was living with his son Alfred in South Bend, Indiana. 6 Fanny Wheeler was born on April 8, 1798 3 in Fairfield, Franklin Co., Vermont. She probably died after 1810. It is not know what happened to Fanny or if she married or left children. She was enumerated in her mother's household in 1800 in Fairfield, Vermont. She was also apparently enumerated in her stepfather's household in 1810 in Fletcher, Vermont. She may have gone with her mother and stepfather to Ohio in 1813, as there is a female of her age group in the 1820 census there in Granville, Ohio. A Fanny Wheeler was a witness to her grandfather Thomas Butler's will in 1814 (in Hinesburg, Vermont). Did she remain in Vermont after most of her family moved west? In 1876, Sarah Thurston Grant (daughter of her half-brother Thomas Thurston) was listed as the half niece of "Fanny Wheeler Wood", suggesting that she married someone with the last name Wood. No further information has been located to prove or dispove that connection. She married second Peter Thurston in about 1802. 1. Stiles, Henry R. Families of Ancient Wethersfield, Connecticut. 1904, New York. 2. Trumbull, J. Hammond. The Memorial History of Hartford, Connecticut, 1633-1884. Edward L. Osgood Publisher, Boston, 1886. 3. Wheeler, Albert G. The Genealogical and Encyclopedic History of the Wheeler Family in America. American College of Genealogy, Boston, 1914. 5. Bostwick, Henry A. Genealogy of the Bostwick Family in America. Bryan Publishing Co., Hudson, NY, 1901. 6. Online cemetery index, Arnold Cemetery, Malone, NY. 8. Tombstone inscriptions, Oak Ridge Cemetery, Bristol, Indiana. 9. Tombstone inscriptions, Stewart Cemetery, Hartland, New York. 10. Thurston, Brown. Thurston Genealogies, 1635-1892, Second Edition. Portland, ME, 1892. 11. Tombstone inscriptions, Spaulding Cemetery, Eaton Co., Michigan. 12. Vital Records of Salisbury, Connecticut. The Salisbury Association, Inc., 1916. 13. Historical Collections Relating to the Town of Salisbury, Litchfield County, Connecticut, Volume II. The Salisbury Association, Inc., 1916. 14. Tombstone inscriptions, Morningside Cemetery, Malone, New York. 15. Tombstone inscriptions, Carroll Hill Cemetery, Fairfax, Franklin Co., Vermont. 16. Tombstone inscriptions, Gilman Road Cemetery, Hinesburg, Chittenden Co., Vermont. 17. Vanderpool, Jennett N. Genealogy of the White Family. Eaton, NY, 1899. 19. Tombstone inscriptions, Olin Cemetery, Canton, Saint Lawrence Co., New York. 20. Tombstone inscriptions, Starksboro Village Cemetery, Starksboro, Addison Co., Vermont. 21. Tombstone inscriptions, Butternut-Willow Creek Cemetery, Clark Co., Illinois. 23. Gazetteer and business directory of Chittenden County, Vermont, 1882-1883.